Saint Mary School is integrating dynamic “hands-on” Science Technology Engineering Mathematics (STEM) labs at our school. These labs compliment core curriculum and are designed to pique student interest in STEM areas through participating in interactive and collaborative labs. All grades levels, from Kindergarten to Eighth grade will participate in a variety of labs each year. The labs vary in length and subject matter, but are truly unique and sometimes, well, wild! Mummified Chickens — In this supplement to a unit on ancient Egypt, students mixed common elements to create the drying substance used to aid in the process of making mummies. They then went through the whole mummification process over the course of a few months and produced actual mummified chickens. 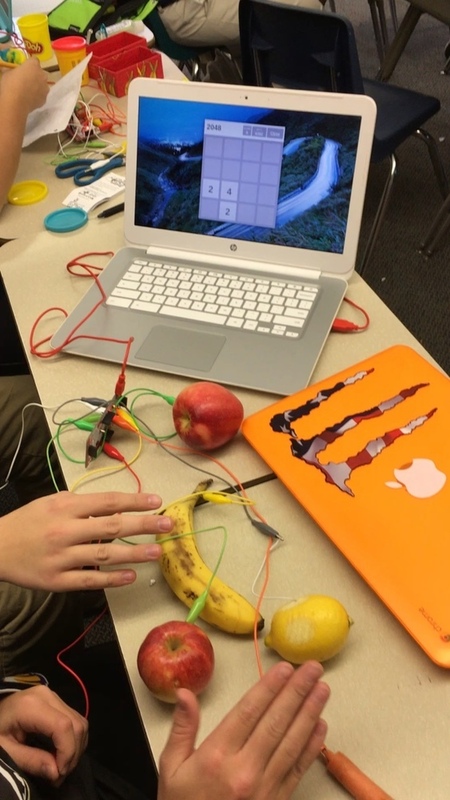 Makey Makey — is an invention kit for the 21st century. While learning about circuits and electrical wiring, students had to engineer a project that turned everyday objects into computer touchpads. Imagine playing the computerized piano on Play-Doh or controlling your computer with fruit! The possibilities are endless! Trebuchets — Using a combination of pencils, popsicle sticks, metal washers and other assorted materials, students had to engineer a siege weapon—similar to what was used in medieval times—to launch marshmallows and see who could hurl them the farthest. Green Screen Compositing — Special effects is big business in Hollywood, and now our Saint Mary students are learning the basics of compositing effects using the chroma key production technique. Archeology Dig — Digging in the dirt can be loads of fun, especially when you find some unexpected “treasure” like a fossil! Utilizing the space around our outdoor classroom, multiple grade levels participate in a DIG during the spring where they excavate history and experience the excitement in this hands-on lab. Playing with Polymers — Students delve into the world of chemistry and get to play everything from instant snow to slime they made themselves. DESMOS Art— is a powerful graphing calculator that works in a web browser or on iOS devices. It can graph color coded functions, plot tables of data, transformations, and more. In our first lab with DESMOS, we’re recreating stain-glass window art using just mathematical equations.